Toyo Ito's Odate Dome is a luminous arena that rests gently upon the landscape of Akita Prefecture in Japan. The daylit structure combines beautiful materials with the latest technologies, and it's designed to withstand winter snowstorms and pouring monsoons. 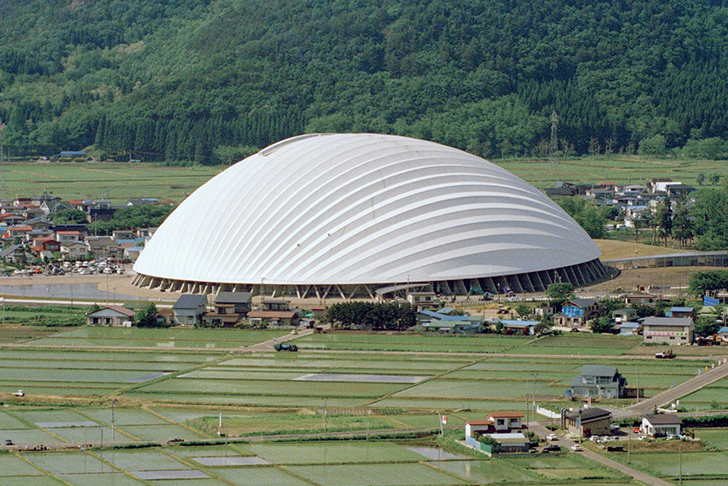 Toyo Ito‘s Odate Dome was completed back in June 1997. The building is a great social space that hosts baseball and soccer games in addition to other events. The oval dome is made from 25,000 sustainably sourced Akita Cypress planks covered by a special double Teflon-coated membrane. This super strong, translucent material protects the interior from the elements while allowing natural light to enter and eliminating the need for artificial lighting during the day. The ingenious aerodynamic design resists strong winds and heavy snowfall. The “floating” dome rests atop the ground floor, which is glazed all around and provides superb views for the people inside. 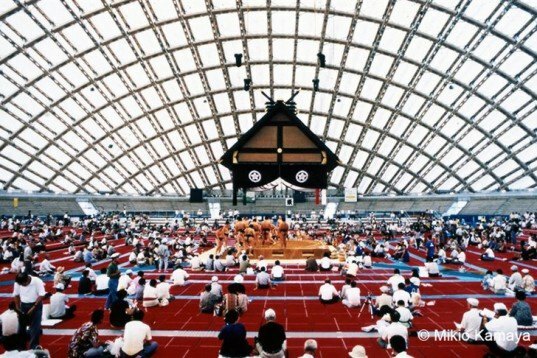 Toyo Ito's Odate Dome was completed back in June 1997. The building is a great social space that hosts baseball and soccer games in addition to other events. The oval dome is made from 25,000 sustainably sourced Akita Cypress planks covered by a special double Teflon-coated membrane. This super strong, translucent material protects the interior from the elements while allowing natural light to enter and eliminating the need for artificial lighting during the day. The ingenious aerodynamic design resists strong winds and heavy snowfall. The "floating" dome rests atop the ground floor, which is glazed all around and provides superb views for the people inside.